Although New York City was the largest American city in 1900, the local government did not issue automobile licenses at any time. Instead, the state assumed that authority in 1901 – becoming the first in the nation to do so. From 1901 thru mid-1903, New York State required automobile owners to file an application with the state, and upon receipt of a certificate in return, motorists placed their initials on the rear of their machines. As explained elsewhere, use of the owner’s initials as a means of identification greatly facilitated law enforcement and made drivers more accountable for the way in which they operated their automobiles. By the middle of 1903, it had become apparent to state authorities that too many owners were displaying fictitious initials, or using their own without first registering. To counter this trend, New York State cancelled every initial license plate, all of which had been provided by the owner, and issued numbers to those same individuals who were then obliged to make new license plates. 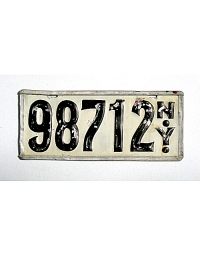 As proof that the number displayed was legal, the state issued registration seals featuring the serial which owners were to use in making their license plates. 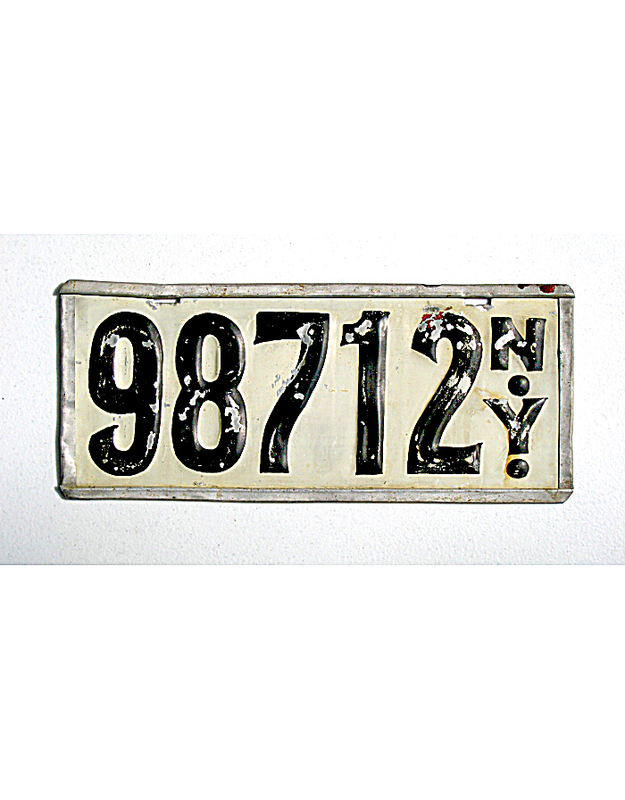 The state initials “NY” were required from 1905 onward, and the colors of the license plates were stipulated as “black on white ground”. New York was the only state in America to authorize this color scheme, which was reverse of the dark colored materials generally used at the time. Consequently, any “black-on-white” pre-state license that bears no state initials is most likely New York from the 1903-‘05 period, as long as the serial number is four digits or fewer. 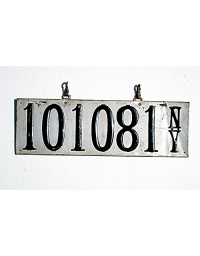 Before the advent of official state license plates late in 1910, over 100,000 registrations were issued, making New York tags among the easiest to collect today from the pre-state era. Neither New York or New Jersey recognized out-of-state numbers, requiring all motorists to license in the state in which they were driving regardless of where they lived. For those living near the state line, venturing into the nearby state meant the display of two numbers. 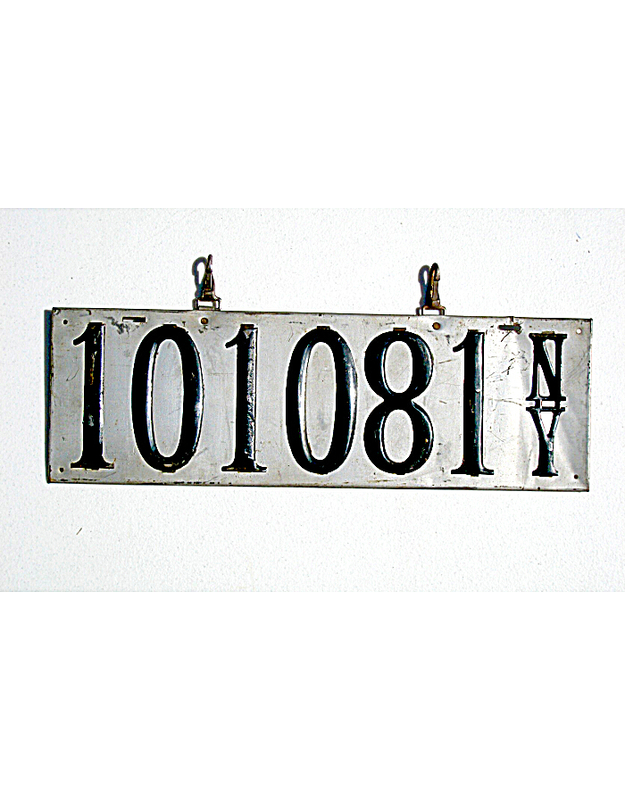 Some creative drivers solved the problem by making double sided license plates which were to be reversed at the state line. These examples are rare.